This last week I have been hygge-ing, is that a verb? :-) Candles, baths and lots of stretching, sometimes even stretching twice a day. I've considered learning to meditate. I haven't felt good, and I haven't really felt as though I could 'speak' on social media really either. Everything felt amplified and as though my own voice would even boom back at me. (As this post might). This feels really uncomfortable, and like there is no boundary between my thoughts and the volume of what's happening out there in life. Like they are waves crashing together in a swell. And I do feel both worlds are linked. I think our inner and outer worlds do reflect each other, in the bigger scheme of things. What we see and notice is a reflection of what's inside us at some level, even if it's an outdated view or something buried in our layers of human consciousness or something we don't want to own. I don't want to be cut off from what's happening either. We're all experiencing this together. Which is why I've found it important to consciously choose when I can, what to allow in. I stopped watching the long news articles a few weeks ago. The headlines find their way through anyway. For me it has been a case of riding those mass thought waves that are out there, that I cannot fail to experience, because they are out there and at the same time trying to stay peaceful and not add anymore vitriol to it. I think whether we live in the USA or not the powerful feelings arising are being felt by all of us, even unconsciously. Whether we agreed with the outcome or not, the stirring of energy is huge. The thing is whatever my present state is, very much affects how things roll at home and I need to keep things here as clear as possible. People are feeling moved in big ways to make things different. This will be the beginning of an interesting time. There is still a lot of good out there and I think today at least, self-care is right up there in flashing lights. (ps. I've forgotten which the other book was, but I will show you if (when!) I get it). Different times for sure, only time will tell of the effects of change. Love the sound of the book, so wonderful that a book could touch your inner self so strongly. I'm glad that you shared this post with us, Heather. 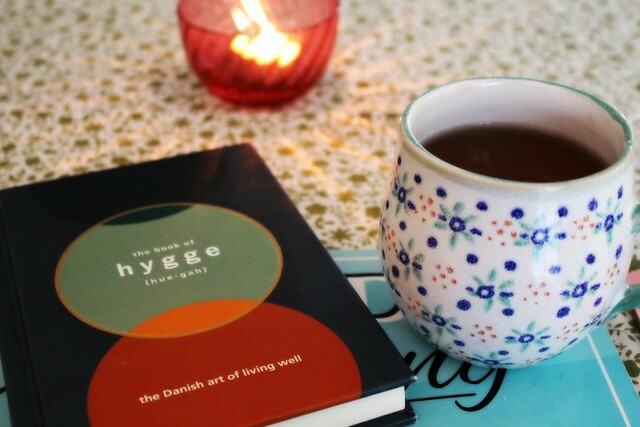 I think I've always practice hygge, without actually knowing about the Scandinavian term. Seems to me that it's a grand to have the concept spread and be welcomed all over. Thank you for writing this post. It's hard to watch what is unfolding around us and maintain a sense of balance. I love the Danish concept of hygge. In fact, I ordered the same book you bought a couple weeks ago and am anxiously waiting for it to arrive from the UK.